These fantastically practical weaning pots are the answer for on the go feeding or just in your home. They are the perfect size for when your little on has a bit more of an appetite, helping reduce waste and give you reassurance on portion size. 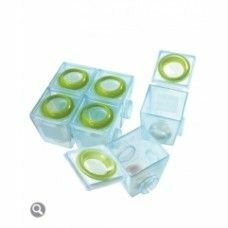 They are freezer, microwave, dishwasher and steriliser safe which is just what you need to keep things simple. You can feed direct from the pot and use the insulated handles to protect your fingers. Or you can use the push through base to remove the frozen meal into your little ones favorited bowl. They click together helping make filling them with your yummy meals easy and reduce storage space too. The pack comes with a pen which you can easily wipe off when refilling with your next yummy mix. With the leak proof hinged lids you don't need to worry about carrying them around when you out exploring for the day with your little one, or when trying to stick them in the freezer after filling. These are the best thing since sliced bread!